Should start by explaining what #FollowFriday is. In a nutshell it was not created by Twitter but by it’s users. 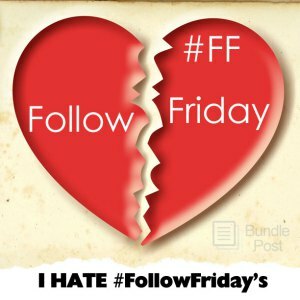 Every Friday people suggest certain followers in their network to other followers in their network by using the hashtag #FF or #FollowFriday. An introduction so to speak. Every Friday morning I feel the love pouring through my laptop from Twitter with mentions containing words like, Smart, Savvy, Funny, Fun, Knowledgeable, Awesomesauce, Mentor, Friend, Favorite. All of them have the hashtag #FF attached to them, designating that they are Follow Friday mentions.